Can Ginger Tea Start Your Period? Ginger tea is a common herbal treatment for digestive disorders. It is also used for pregnancy-related nausea and painful menstrual periods, according to the University of Maryland Medical Center. There is no scientific evidence to suggest, however, that it can help to start your period. Ask your doctor before using ginger tea for menstruation. Ginger is a popular seasoning used in cooking and flavoring candies and other foods. It contains the molecule zingerone, explain Penny Le Couteur and Jay Bureson in the book "Napoleon's Buttons." This molecule, related in shape and function to capsaicin from chili peppers and piperine from black pepper, binds to pain receptors. This gives ginger its characteristically hot sensation on the tongue. Your menstrual period occurs each month as your hormone levels start to fall. Each month when an egg matures, the tissues surrounding the egg produce estrogen and progesterone, explains Dr. Lauralee Sherwood in her book "Human Physiology." The rising hormone levels cause proliferation of the uterine lining in preparation for implantation of a fertilized egg. If no egg implants, hormone levels drop and you shed the uterine lining. If you haven't gotten your period when you expect it, you can't expect ginger tea to help it start. 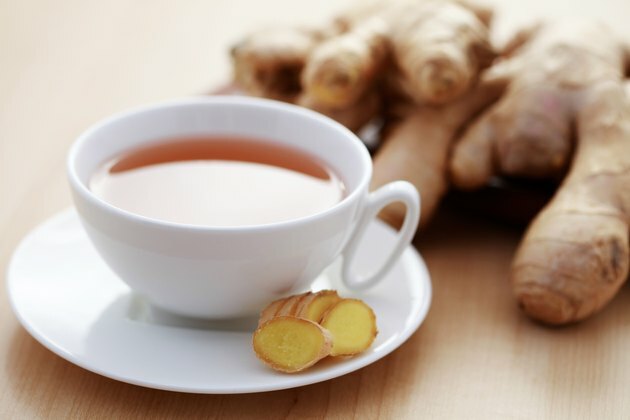 While there's some evidence that suggests ginger tea is good for morning sickness, motion sickness and the nausea caused by chemotherapy, explains the University of Maryland Medical Center, there's no evidence that it can initiate menstruation. If you want your period to start, see your doctor. Your physician will evaluate you based upon the date of your last period and your typical menstrual cycle length, and will also perform a pregnancy test. If you need a "jump start" to get your period going, your doctor can prescribe hormone pills that will cause the lining to shed. Do not attempt to use ginger tea to start your own period before talking to a doctor. Does Ginger Root Decrease a Woman's Menstruation Cycle?